Do you love wearing workout gear…when you’re not working out? Since I’ve started working out at the gym around 4 times a week (on a good week), I’ve noticed I’ve been wearing my gym clothes out and about more. It’s easier and more convenient for me to get my workout in and then head next door to the grocery store. I’ve also been purchasing more workout clothes so I don’t have to do laundry over and over again. It’s important to me to feel good in what I’m wearing and be able to run errands in it, if necessary. 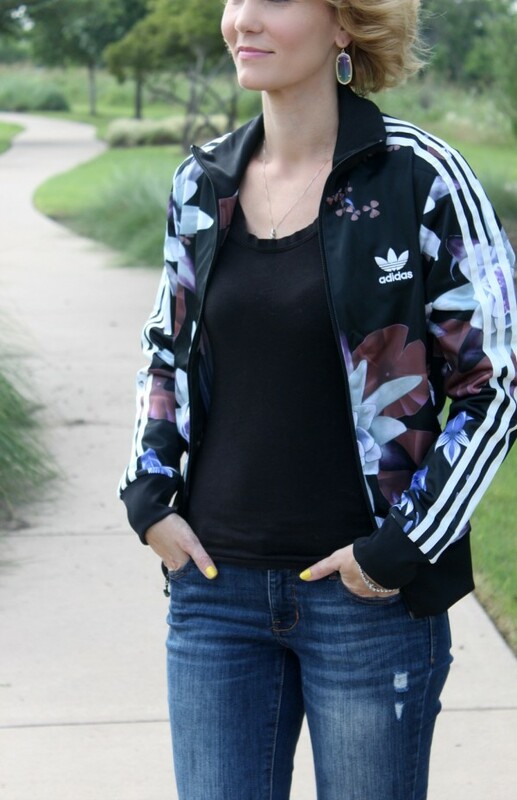 I recently discovered the adidas Lotus line (which is on clearance btw) and love it because I can wear it to the gym and mix and match it with my wardrobe to create fun outfits. The track top I’m wearing has been worn a lot the past couple of weeks. I’ve worn it to the gym and paired it with jeans and a t-shirt. It’s very well made and is just the right weight for cool spring and summer nights. I also typically bring a jacket with me everywhere I go because I get so cold indoors when the air is blasting. Which when it comes to Texas in the summer – the air is always blasting indoors. 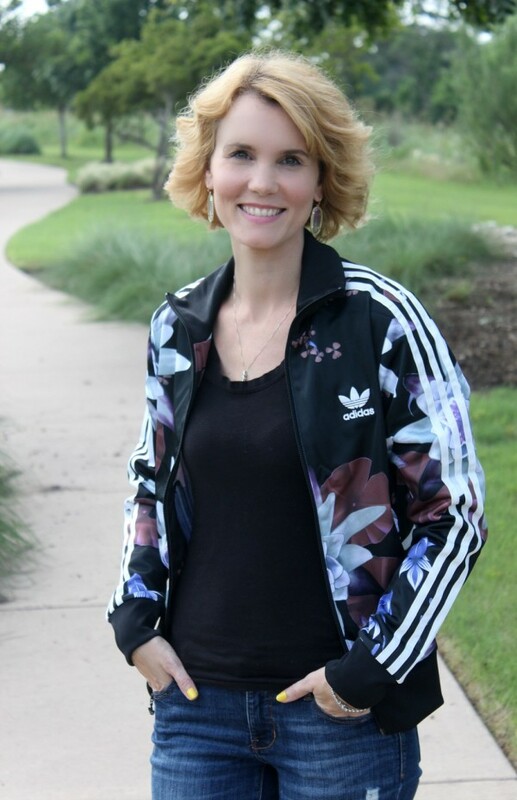 There’s one item of clothing from adidas that I’ve had my eye on for years and that’s a pair of their classic white sneakers with black stripes. They bring me back to the 80s as a child when I remember thinking how cool it would be to own a pair of those. Fast forward to 2015, add the lotus pattern and oh.my.gosh….you get these. GORGEOUS aren’t they? I’m sad to report that they don’t have these in stock online, but they do have some other great patterns in the Superstar style. I really like the way they hug my foot and kick my outfit coolness factor up about 100 notches. I don’t wear the Superstars to the gym, although I’ve heard they’re great for squats. But I do wear the track jacket quite a bit. Stay tuned for another feature starring some of my favorite workout clothes! Disclosure: Mom Fabulous received samples to facilitate this post.